This picture was exhibited in Manchester at the end of 1895, and was offered for sale at £70. Crowe accepted £35 for it from Mr Frederick Midgley, one of a firm of Manchester shipping merchants, on 7 January 1896. It was sold at auction by Leonard Joel auctioneers of Melbourne, Australia, on 3 December 2013, for $AUS 4,200 (£2,330). No artist known to us has so effectually recovered himself of late as Mr. Crowe. This year his contributions bear witness to his endeavours to escape from that hard and dry manner which, joined to the partial opacity of his painting, has deprived his art of not a little of the credit due to it. 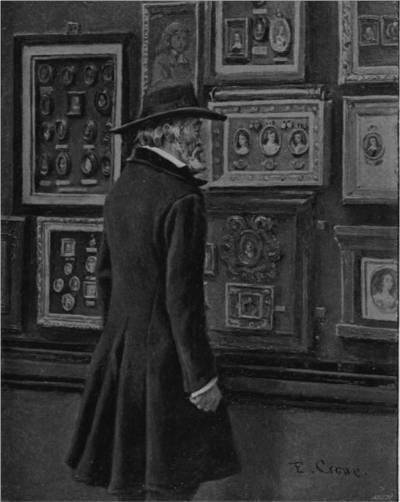 Thomas Carlyle looking at the Duke of Buccleuch’s Miniatures of Cromwell, his Wife, and his Daughter (674), as they hang on the red wall of a picture gallery, an incident actually witnessed by Mr. Crowe, possesses a limpidity we seldom find in his paintings. Its lighting is bright, and it approaches very nearly to what we might venture to call a good piece of colour. The portrait of the sage is wonderfully faithful, and not only the costume – the stiff black coat, for instance, and black felt hat – and the features, but the demeanour, the fitting of the coat-collar about the wearer’s neck, the carriage of his head, and the set of his hat, are perfect. The red wall of the room is covered with miniatures (late the property of the Duke of Buccleuch) in gold frames, and adds much to the warmth of an interesting little picture.